Well, it has been two close games so far in the AUS men's hockey championship. How close? How about the first decided in overtime and the second in double-overtime, with UNB and StFX each coming away with a win in Fredericton. The No. 1 ranked Va rsity Reds and the No. 7 ranked (and underrated) X-Men are locked in a tight-checking battle for pride, as both teams are already ensured a berth at the Cavendish University Cup. 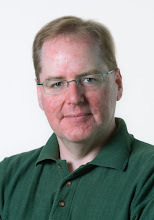 The V-Reds want to play their customary uptempo puck possession game while "X" is committed to team defensive systems that clog up the middle and take away time and space from their opponents. 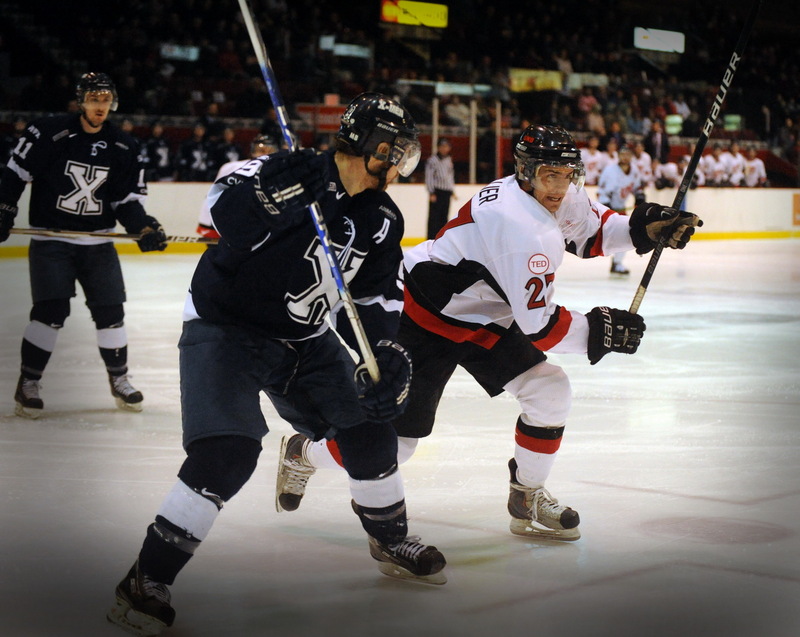 For two periods Friday night the StFX playbook was winning out. 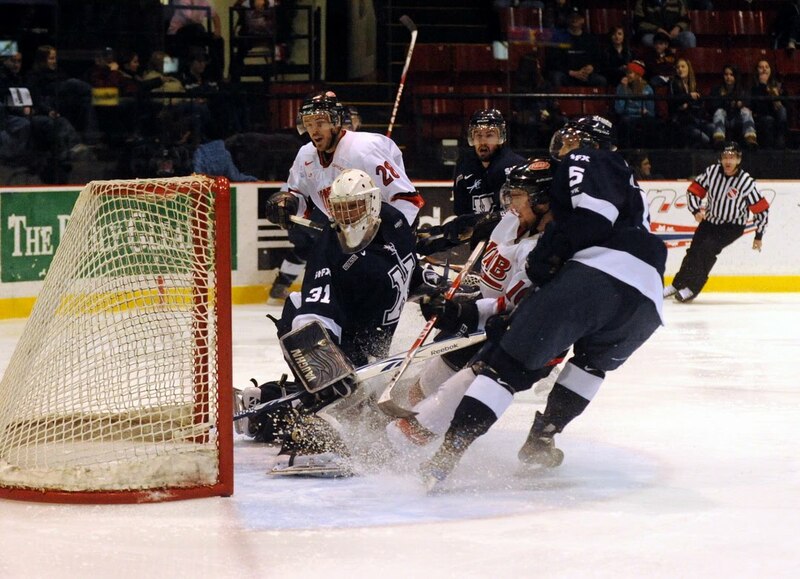 Rookie X-Men Jason Bast scored off the rush in the second period and Murdoch MacLellan got a gift goal when the rebound from his shot glanced off a UNB defenceman's skate and into the net. In the third period UNB made some adjustments, particularly with their struggling breakouts, and started to get pucks deep with some consistency. They scored two goals in less than two minutes off deflections that Joey Perricone had no chance on, the first by Hunter Tremblay and the second by Daine Todd. The overtime period was all UNB as they swarmed the StFX zone. After the X-Men iced the puck to get a line change, UNB's Chris Culligan won the faceoff clean back to defenceman Ben Wright who waited a heartbeat for the screen to develop in front of him before firing a wrist shot that beat Perricone on the short side and the game was over 64:34 of hard fought play. 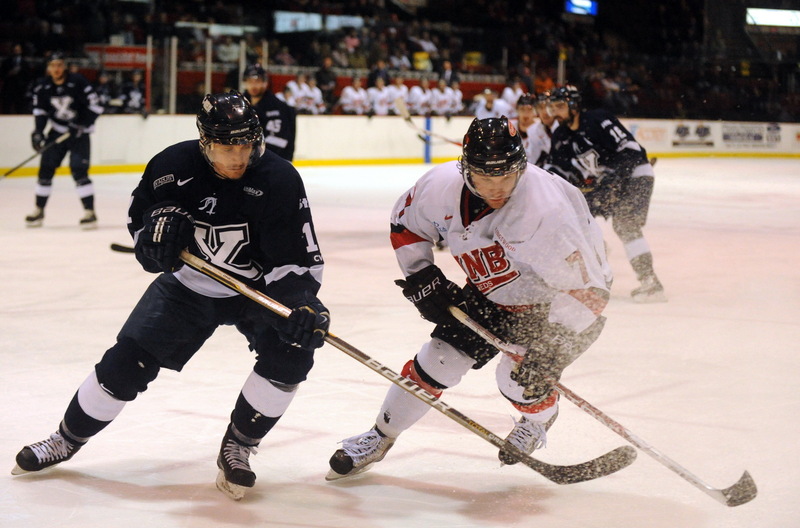 Saturday night UNB had a better start, but still the game was scoreless after 40 minutes. 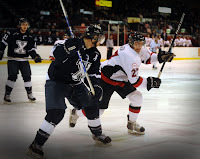 At some sustained V-Reds pressure in the early part of the third period, at 6:44 StFX made a foray into the UNB zone. Matthew Bragg put on a puck control display, from the right corner back to the inside of the blue line and then the left circle before letting the puck go that Spencer McAvoy deflected past Travis Fullerton. After icing was waved off got UNB got three players deep with the puck and tied it up at 15:08 when captain Kyle Bailey put the third whack at the puck past Perricone. The first overtime Saturday was uneventful more the most part, but fairly balanced. At 2:42 of the second OT the faceoff was at the left UNB faceoff circle after a missed attempt for a stretch pass was whistled down for icing. Then in a stunning move on the puck drop, Phil Mangan successfully went for the shot forward instead of attempting to win the draw back, and the puck found the inside of the post just past a surprised Fullerton. The shocked crowd filed quietly out of the AUC, and now Game 3 and 4 will be in Antigonish on Tuesday and Wednesday night.